BROOKLYN, N.Y., Feb. 12, 2019 /Christian Newswire/ -- New York Attorney General Letitia James has abandoned on appeal attempts to censor the Christian and pro-life speech of Liberty Counsel's client Scott Fitchett, Jr. as he preaches the gospel on the public sidewalks outside New York's largest abortion business. 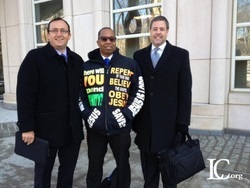 Photo: Liberty Counsel's Harry Mihet and Roger Gannam with Scott Fitchett, Jr.
Fitchett and 12 other defendants were sued in June 2017 by former New York Attorney General Eric Schneiderman who sought a preliminary injunction to shut down the Christian and pro-life speech of the defendants outside Choices Women's Medical Center in Jamaica, NY. Fitchett is a pre-K teacher who has spent Saturdays peacefully sharing the gospel on public sidewalks throughout New York City, including outside Choices "to persuade women to change their minds about seeking an abortion by communicating the gospel of Jesus Christ." Judge Carol Bagley Amon of the federal Eastern District of New York denied the preliminary injunction in July 2018 after a 14-day evidentiary hearing. The Attorney General appealed the denial to the federal Second Circuit Court of Appeals, as to all defendants, but has now informed the appellate court that the appeal is abandoned as to Fitchett. Schneiderman filed the original lawsuit under the federal Freedom of Access to Clinic Entrances Act, enacted by Congress to prevent actual violence and physical obstruction of abortion facility entrances, and similar New York laws. Schneiderman intended to silence the pro-life and Christian messages he openly despised. He launched the lawsuit against Fitchett and the other defendants with a press conference outside Choices, where he touted his pro-abortion credentials while shockingly berating pro-life Christians who he said "run their mouths" with "unlawful, un-American rhetoric." Flanked by the millionaire abortionist and Choices owner Merle Hoffman, Schneiderman smugly declared, "We are not a nation where you can choose your point of view," and denigrated Christians' efforts to counsel women and advocate for the life of the unborn as "horrifying" and "illegal." In a sad twist of irony, Schneiderman would resign in disgrace less than a year later after serious allegations that he physically abused four women. "It was clear after a 14-day hearing that the Attorney General could prove no wrongdoing against Scott Fitchett, and never should have filed a lawsuit against him," said Liberty Counsel's Assistant Vice President of Legal Affairs Roger Gannam. "Perhaps the new Attorney General has realized that Scott Fitchett not only has a constitutional right to speak on New York's public sidewalks, but will not bow down to the state's pro-abortion bullying and intimidation. Now the Attorney General should dismiss all claims against Fitchett," said Gannam.